In this day and age everything is INSTANT. Instant news, instant information…. instant coffee. “Instant” news (and media) sometimes distorts people’s minds and their perception of reality by making many successes look easy. A person reads a story of how someone became an instant millionaire and how it happened “overnight”. That same story probably doesn’t mention the endless nights slogging away at their project while neglecting friends and family. Nor does it mention the difficulties they had to overcome or the many failures before that moment. Oh, though it appears “instant” because this is the first time you’ve heard of that person or thing. And people may think …. if that successful person can do it overnight…. so can I know. Well unfortunately “overnight” success usually takes months or even years of planning, experimenting and working towards your goal. Just think of J.K. Rowling and her first Harry Potter novel. How many years did it take to write? How many rejections did she receive? That supposed “overnight success” was in fact many weeks sitting at a local café to keep warm because the flat (apartment) was too cold. There is no quick elevator or fast route to being successful. It usually takes time and often with failures first. But one thing is certain, if you don’t give up and keep striving towards your goals…. you can be successful. There’s just no quick way or elevator to get there. 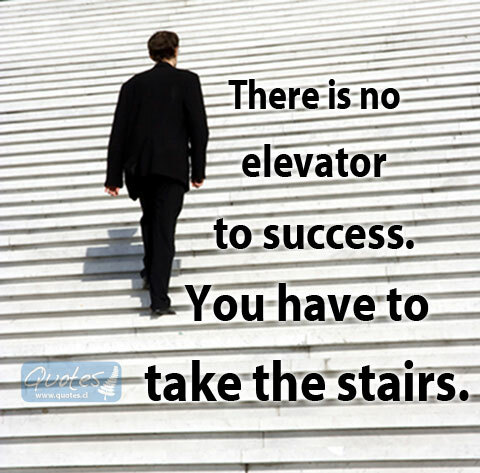 You just have to work and take the stairs.